Thanks once again to Cook the Books for introducing me to another great biography of a food legend. Specifically thanks to Deb at Kahakai Kitchen for recommending this book and hosting this month. What is said book, you ask? 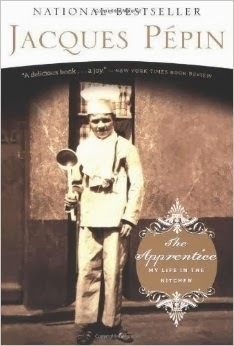 The Apprentice: My Life in the Kitchen by Jacques Pépin. This book was a quick summer read and I couldn’t put it down. I finished it in record time. On my last post (for FnF), I wrote about quirkiness. Forgive this rambling post today but The Apprentice struck me as a testament to how Pépin figures into the cultural literacy of the United States, his adopted home. Read on for my quirky popular culture connections to Jacques. Pépin’s cast of characters from his life reads like a who’s who of the culinary world—James Beard, Craig Claiborne, Julia Child, etc. He is honest and sincere about these friends. Even when disagreements or un-pleasantries arise in the relationships (personal or professional), he is sympathetic to everyone’s situation. There is no back-biting here. This is not an exposé. Pépin is not out to shock or amuse by weaving tales of bad behavior. He simply states the facts about his famous acquaintances (and many times in a sympathetic tone). What struck me the most about The Apprentice is Pépin’s humor (much of it self-deprecating). He isn’t above describing his humorous misadventures and foibles. Yes, it was Pépin who was with Julia when she “cut an artery” on live TV, the scene that was perhaps made more famous by Dan Ackroyd on SNL But, seriously folks, I remember watching Julia and Jacque on lazy weekends, enjoying their casual and easy ribbing and interplay. What a duo. I found their show so relaxing to watch. I was also really amazed that he worked for HoJo’s. 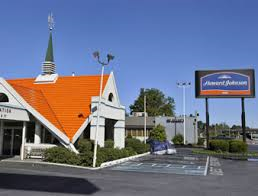 By the time my sister and I came of age, there were few Howard Johnson’s left, especially in our part of the country. That didn’t stop us though, from hounding our parents when we traveled by pleading, “Please, please, please, PLEASE can we stop there? !” I think we were enamored by the giant orange roof. We never did stop and I have no idea where she got this stance against HoJo’s. Needless to say that I wanted to call her up and read to her the accounts of Pépin’s time working with Howard Johnson’s to elevate the food and make gourmet eating available in a mass market. I was also surprised to read that Pépin owned a soup restaurant in NYC, one that became very successful. So you know what images came to mind there, right? 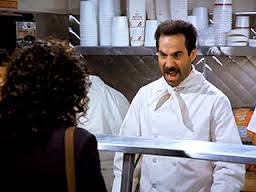 Soup Nazi….No resemblance to Pepin except for the making of soup…. 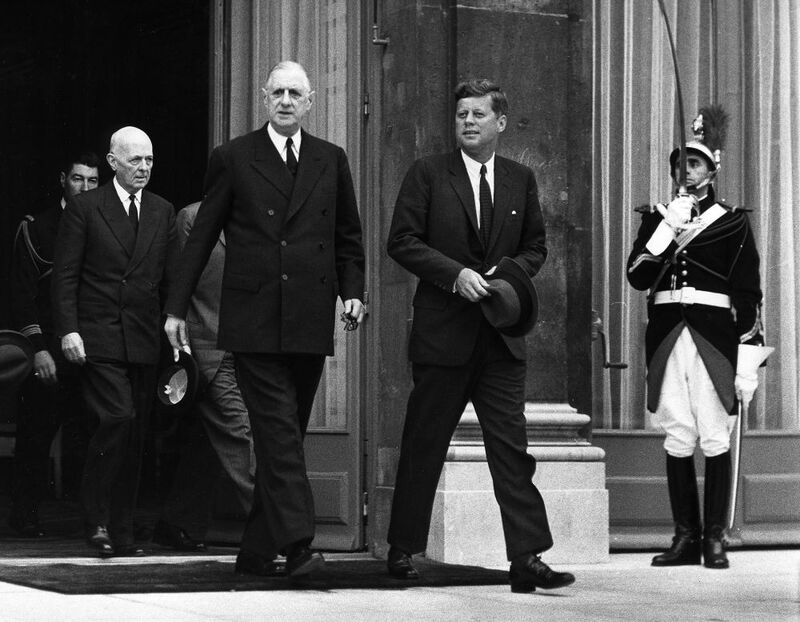 I could go on and on….how he cooked for two of the most powerful and famous world leaders—de Gualle and JFK, how Pépin was a forerunner in the trend to gourmet cooking at home (with his classes), how he was a locavore before it was trendy, and how his cuisine morphed from being French-centric to being truly original American dishes incorporating all of his influences. 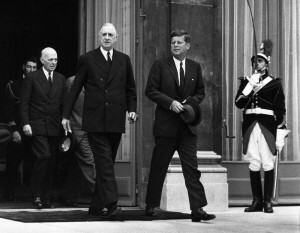 De Gaulle and JFK….two men that were able to enjoy Pepin’s food. So enough about my bizarre connections between Pépin and American popular culture and on with my inspired-by dish. Preheat oven to 425 degrees. Make the dough by putting all the ingredients (except the hot milk) into a food processor. Process just until the ingredients start to combine. Add the hot milk and pulse a few more times. Don’t over work this very soft dough. Place the dough in a 9-inch pie plat or a fluted tart pan. Use your fingers (dusted with flour) and press the dough into the pan until it covers the bottom and sides. Set aside. Make the filling. Peel, core and halve the apples. Cut each half into 1 1/2-inch wedges. Arrange the wedges on the dough like the spokes of a wheel. Combine the cinnamon and sugar. Sprinkle the sugar mixture over the top of the apples and top with the butter cubes. I don’t know that this really resembles a wagon wheel! Bake tart for about 1 hour or until the crust is golden. Cooling on the cabinet with other apples, tomatoes and cucumbers (the latter two from our gardent). Thank you for bearing with me during this quirky ramble through the life of Jacques Pépin. Even better with ice cream at dusk. Thanks, CTB Club (and Deb) for another great read. For all my CTB posts, click here. I can always learn something new and interesting from your posts. That’s a great apple tart, Debra. Thanks and you are welcome to a piece, Deb. Great job picking the selection for this round. I truly love reading chef memoirs. Liz, I know that you would love this book. Must add it to your reading list as soon as you are able! G’day What a great post that I really enjoyed today! Thanks for brightening my day! Cheers! Joanne P.S. Great recipe! Glad you liked it, Joanne. What a great post! Love the things you chose to highlight from the book and yes, I do remember the SNL skit between the two. An unforgettable skit. Looks like I need to read this book. Great choice of recipe to make. 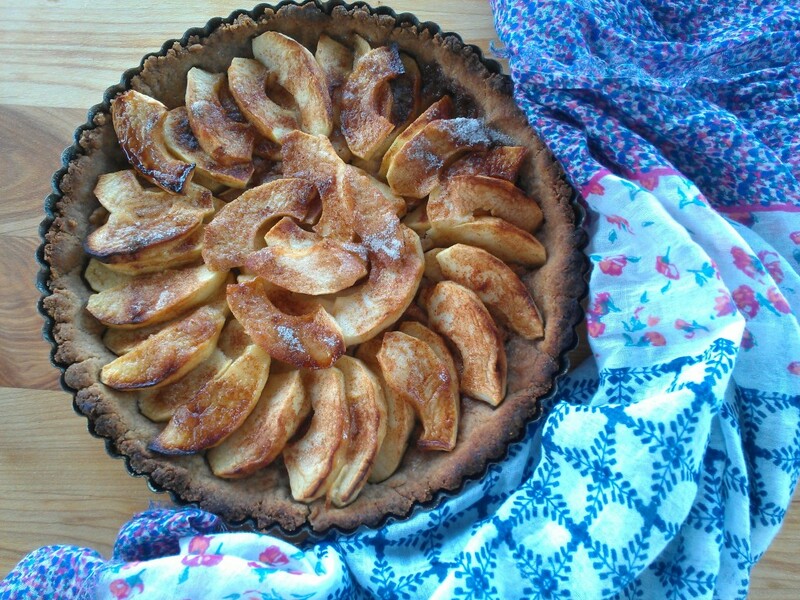 Who doesn’t love an apple tart!? Who could not remember Dan as Julia? It is a classic–as is Jacques. I really enjoyed learning about his early life in France as well as his coming of culinary age in the U.S.
I’m not a huge fan of celebrity chefs but Jacque is one of those I could watch all day. I also remember watching him and Julia together (though I don’t remember the artery cutting thing). I’m loving the tart, my friend. It looks amazing. This tart looks amazing, I’m such an apple girl. Jacque is such a classic chef, I know the book is amazing. Thanks, Chris. He is one class act, isn’t he? So many hilarious points here in this post! You are a great ambassador for introducing folks to this great book. Can’t wait to tuck into your pick for the next round of Cook the Books. A trip to Venice with Marlene di Blasi is just the ticket! Thank you,Rachel. Hope you enjoy the sojourn to Venice. I love your posts and this one was as delicious as it was amusing. I was also shocked Pepin worked at HoJos so long! Yep, even if I didn’t have the mom factor here, I believe the Hojo’s connection would have surprised me. 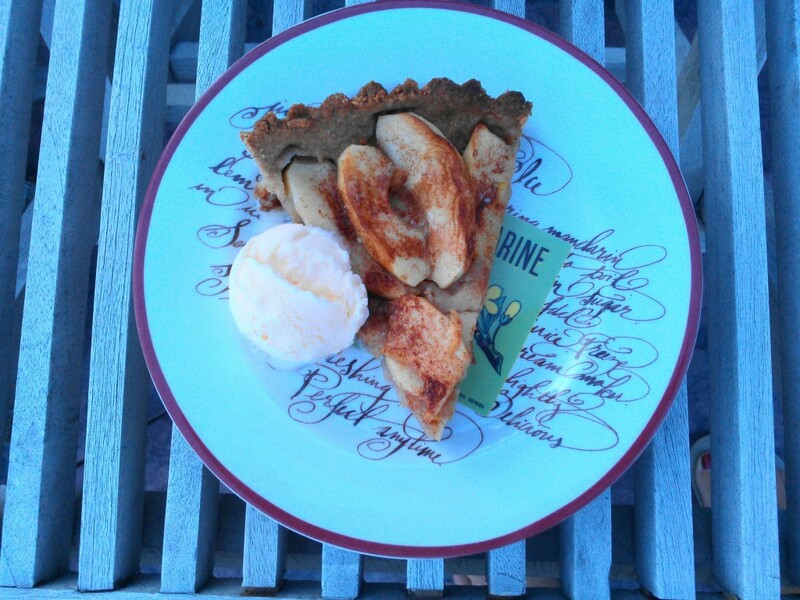 Great choice with the apple tart Deb. I enjoyed the book very much also and your posts always make me laugh. Looking forward to this month’s selection. Thanks. So glad you joined us all, Wendy. There are some huge shoes to fill following Deb’s pick! Hope Venice can hold up? Thanks, Cathy. I think the next time I make this tart, I will glaze it with some apricot jam after I remove it from the oven for a glossier presentation. I love this pastry crust! I enjoyed reading your “quirky ramble” 🙂 Great choice of recipe. 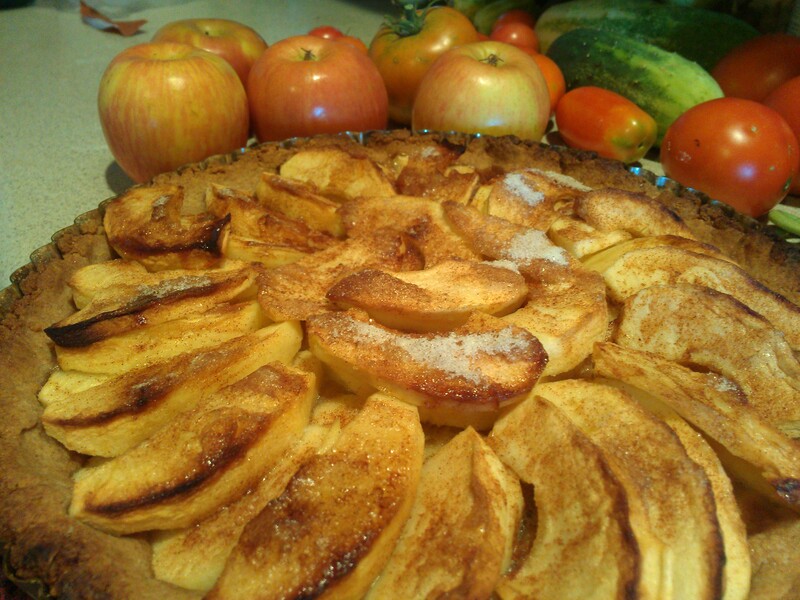 As a new apple season is upon us, it is a delight to turn the juicy fruit into a simply sumptuous dessert. Thanks, Simona. As I am finishing up picking off our peach tree, I am working on making a peach tart with this pastry dough. I see another Hojo’s post in your future after you read this book! I smiled the whole way through! Yes, he was truly entertaining to read, as well as informative. 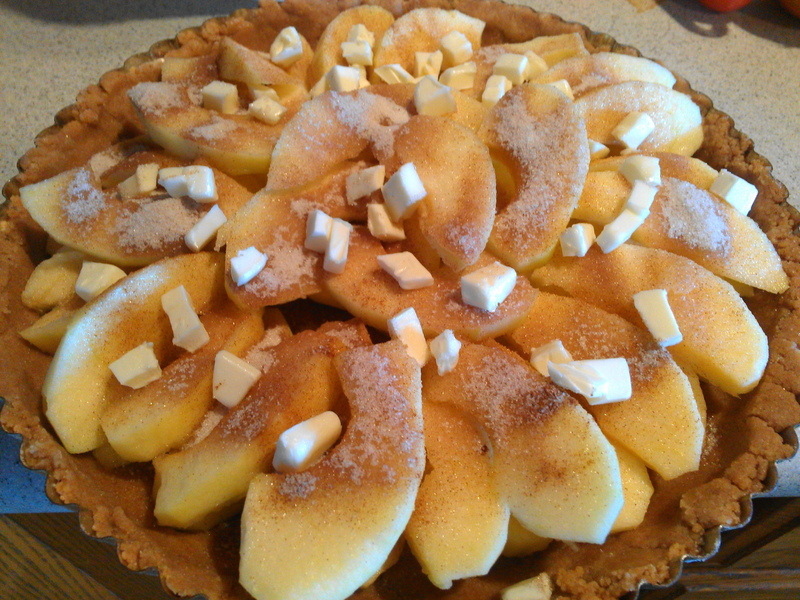 And, what an awesome looking tart you made! Thank you, Claudia. Such a good read indeed. 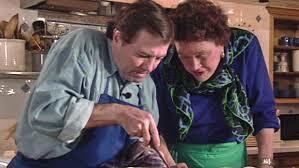 I love the tart and the story about Jacques Pepin. I loved to watch him on PBS. He seems like such a genuinely kind individual, doesn’t he?